EJ Palmer Consulting is headed by Emma Palmer Foster. Emma has over 20 years' experience in the European healthcare sector, including roles in investment banking, investor relations and strategic communications, technology transfer and journalism. As a consequence she has a broad-based understanding of the issues surrounding the biopharmaceutical sector, extensive transaction experience, and brings a clear external perspective. Emma has worked extensively with organisations in the start-up phase, with particular experience in public-private initiatives. Cell therapy, open innovation and pharmacogenetics are areas in which she has been active recently. Starting her healthcare career at Scrip World Pharmaceutical News, she then moved to CRC Technology, the technology transfer arm of the UK Cancer Research Campaign (now Cancer Research UK). This was followed by roles in healthcare banking in the City, working as a life sciences sell-side equities analyst at Williams de Broe, Robert Fleming Securities, and WestLB Panmure. At the latter she was a rated analyst and part of the highly successful life sciences franchise - one of the leading fund raising and transaction drivers in the European biotech sector in the late 1990s and early 2000s. Later she joined ING Wholesale Markets to head up European Healthcare Corporate Finance. Emma has also used her strategy and communications skills in investor and public relations activities. At Northbank Communications (now College Hill Life Sciences), she established and grew the financial communications and IR franchise to 19 listed and non-listed clients. Emma is a Visiting Fellow at Durham University Business School, a member of the UK Investor Relations Society and a holder of its Certificate in IR, as well as a Member of the Chartered Institute of Public Relations. 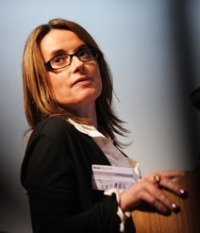 She sits on the National Institute for Health Research (NIHR) Invention for Innovation (i4i) Selection Panel, is a member of Stevenage Bioscience Catalyst Experts Panel and is a frequent speaker, conference panel chair and member. Qualifications are an MA in Biochemistry from the University of Oxford, and an MBA from the Durham University Business School. Emma was from 2008-2012 a Trustee of South Bucks Counselling and volunteers for a number of local and national charities.